This weeks challenge is about stitching! just use some kind of stitching on your project. image onto a piece of muslin and then cut it out. So pretty! I love the CAS design and how you stamped on muslin. Beautiful card! So bright and cheery, love all the yellow! 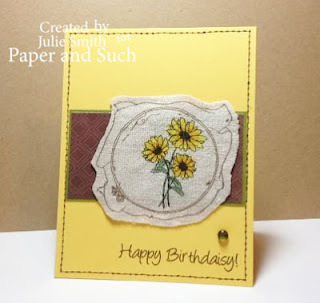 Love the stamping on the muslin! So pretty! so beautiful Julie! the stamped muslin is fabulous! !